Once we understand the basic terminologies of PA it would be easier to move ahead with the process. Project: A project is a primary unit of work that can be broken down into one or more tasks. Task: It is the small unit of work created under the project against which transaction can be created. Note: we cannot create transaction/expenditure items directly on the project, hence it is mandatory for each project to have at least one task. Oracle PA has provided three pre defined project classes. Indirect projects – Track overhead activities and costs of the organization. Note: Does not generate revenue and invoicing process. Capital projects – Track asset development activities and costs, and costs are capitalized as one or more assets. Contract projects – Contract projects created with external customer to track cost, revenue, and billing. The project type controls how Oracle Project Foundation creates and processes projects, and is a primary classification for the projects your business manages. You must set up at least one project type to create projects. You must set up project types for each operating unit. Examples of Indirect project: Admin Project, Transport Facility etc. Example of Contract project: External Project, Intercompany project etc. Expenditure category: It is the category created to classify the different types of cost an organization may incur. Revenue category: It is the category created to classify the different types of revenue an organization may earn. Expenditure type:It is the identification of cost that is associated to an expenditure item.It is assigned to the expenditure category and revenue category during the setups. Expenditure class: It is the classification for an expenditure type as how the expenditure type can be used to create transaction. When an expenditure type is classified for a certain type then only those expenditure class transactions are allowed to enter. In Oracle Project Costing we have predefined expenditure classes. Straight Time: For standard time entry. We use the cost rate multiple with number of hours. Overtime: Labor cost calculated using a premium cost rate multiplied by hours. Expense Reports – Expense reports from Oracle Payables or Oracle Internet Expenses. You cannot enter expense reports directly into Oracle Project Costing. Expense reports that you import into Oracle Project Costing must be fully accounted prior to import. Usages – You must specify the non-labor resource for every usage item you charge to a project. For each expenditure type classified by a Usage expenditure type class, you also define non-labor resources and organizations that own each non-labor resource. Supplier Invoices – Supplier invoices, discounts, and payments from Oracle Payables or an external system, and receipt accruals from Oracle Purchasing. Burden Transaction – Burden transactions track burden costs that are calculated in an external system or calculated by Oracle Project Costing as separate, summarized transactions. These costs are created as a separate expenditure item that has a burdened cost amount, but has a quantity and raw cost value of zero. You can adjust burden transactions that are not system-generated. Work In Process – You use this expenditure type class for Oracle Project Manufacturing WIP transactions that you interface from Manufacturing to Oracle Project Costing. You can also use this expenditure type class when you import other manufacturing costs via Transaction Import or when you enter transactions via pre-approved batch entry. Oracle Project Manufacturing transactions that you import from Manufacturing or Oracle Inventory. Oracle Inventory Issues and Receipts that you import from Oracle Inventory in a manufacturing or non-manufacturing installation. In the above examples for line number 1, time can be entered for expenditure type “Standard_Time”. Similarly for line number 2 & 4 the respective expenditure class transactions can be entered. For line number 3 supplier invoices & expense reports can be entered as it has been classified for two different classes. Transaction Currency:The currency in which a project transaction occurs. Expenditure Functional Currency: The functional currency of the expenditure operating unit. Project Functional Currency: The functional currency of the operating unit that owns the project. Project Currency: The user–defined project currency. When you enter transactions in a currency that is different from functional currency or project currency, Oracle Project Costing must convert the transaction amount to the functional and project currencies. To convert transaction currencies, Oracle Project Costing must first determine the exchange rate type and exchange rate date. Billable Item: It is a functionality associated at the task level identifying the expenditure items created against the task to be billed to the client. Non Billable Item: It is functionality associated at the task level identifying the expenditure items created on the task is only to record the cost incurred against it. Note: We can adjust the task at the expenditure item window to make the non billable as billable and vice versa. This is called as expenditure item adjustments. Employee/Job bill rate Override: Incase a different rate needs to be updated for a particular job or employee the same can be updated at the project or task level. The employee name needs to be entered along with the bill rate, currency and period applicable. The rate at the task level overwrites the rates at the project level and the rates at the project level overwrites the rate of the bill rate schedule attached at the project level. Cost rate: It is the rate defined at the job or employee level to derive at the basic cost for a particular expenditure item. The cost rate scheduled are defined in the OU functional currency. In the setups -> Expenditure -> Rate schedule. Bill rate: It is the rate defined at the job or employee level to derive at an amount which will be billed to the client. Overrides: At the project level as employee or job override. ICB: It is a process, where we have different legal entities involved, and the OUs under these LE owns the employees and projects. The OU to which the employee is assigned is called PROVIDER OU. The OU to which owns the project is called RECEIVER OU. Note: In ICB process, an internal invoice is generated in provider OU. Borrowed And Lent: It is a process, where we have one legal entity involved, and the OUs under the LE owns the employees and projects. The employee and project can be in the same OU or different OU but the LE has to be same. Note: No internal invoice is generated in B&L process, only accounting happens to post cost. Labor: When an employee enters time on a specific project it is known as charging efforts of the employee on the project for a given time frame. This time further has some cost defined to calculate the actual cost incurred by the employees on the project. The calculation process of the raw cost for such labor/time entered is called as Labor Cost. The time can be entered via a third party tool or via the PA pre approved batch. Overtime – Labor cost calculated using a premium cost rate multiplied by hours. Non labor expenditure types: The expenditure items created via supplier invoices or expense reports are called as non labor expenditure types. The expenditure types created need to be added in the non labor expenditure schedules. Navigation: PA -> Setups -> Expenditure -> Rate schedule. When an employee enters time on a specific project it is known as charging efforts of the employee on the project for a given time frame. This time further has some cost defined to calculate the actual cost incurred by the employees on the project. To initiate the process of cost calculation, there are few setups to be created at OU level. Pre requisite setups to initiate time entry. Implementation option to be defined in the costing tab. The option “ Interface Employee Labor Costs” is enabled, the labor cost lines accounting is interfaced to GL. 2. Rate schedule to be defined for cost rates. Cost Rate: The cost rates is the basic cost defined at the employee or job level in the functional currency. This is the cost used to calculate or derive the raw cost for each expenditure item of type labor/time. Note: For time the Unit of measure is always hours. Example: cost rate = 100 USD time entered for a day = 8 hours. Raw Cost = Quantity X cost rate, hence raw cost would be 100USD X8 hours. 3. Cost rate schedule to be assigned at the OU level. 4. Transaction source definition for time entry. Note: In an organization when a third party tool is used by employees to enter time, a customized transaction source can be defined for same. There are various functionalities available for treating the expenditure items created via the transaction source. Purge After Import: The expenditure item once created will be automatically purged from the PA interface table. 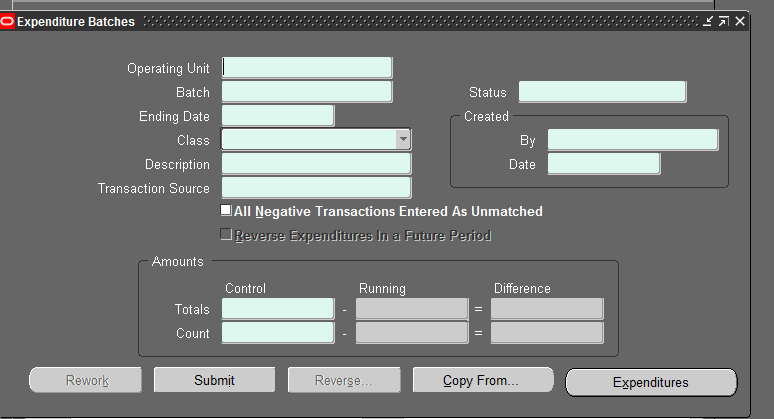 Allow Reversals: The expenditure items/batches created via the source can be reversed in PA. Adjustments: The expenditure items created via the source can be adjusted in PA. Note: The other can be enabled as per the business requirements. Once the above setups are created, we shall now see how to enter time for a project via a pre approved batch. In the form, we need to enter the OU, batch name, ending date & class. We shall create the batch for time entry. Click on Expenditure Items: Enter employee details. It will take you in the below section of the form where we need to enter the date of the expenditure (expenditure item date), project code, task code and the expenditure type and quantity. Note1 : The project should be in approved status, employee should be assigned to the same OU in which we are entering time. Note2: When we have employees entering time on projects from other OU of different LE it is included in the ICB scope and if time entered in different OUs within same LE it is included in Borrowed And Lent Functionality Scope. Once the time has been entered the pre approved batch needs to be in status “Released” for the further costing process. Working: The transaction is being entered and the batch is still open for making changes. Submitted: The batch has been eligible for the next process of being released, however if more changes are required, the button “Working” can be clicked to make changes as required in the same form. Released: Once the batch is in submitted status it is eligible for getting released. Once a batch has been released no changes will be allowed to the batch (the working button is disabled). If changes are required in the batch at this stage the batch can be reversed. Note2 The batches with released status is eligible for cost distribution. The new expenditure items are created and now in the cost distribution process, the raw cost (also known as basic cost in PA) has to calculated. The newly/existing expenditure items can be viewed from the below screen. Process to calculate the cost: Execute the following program to distribute cost and interface to GL. Note: The above programs can be executed as single concurrent programs as well. In the expenditure inquiry window we can query the project and check the expenditure items entered and the cost generated for the expenditure items in the column “Project Functional Raw Cost”. Note: Once the cost distribution has been completed successfully the cost distributed flag is auto checked by the system for the expenditure item ids. The further process ie, revenue is generated only if this cost distributed flag has been checked ie the billable expenditure items are eligible for revenue and invoice process if the cost distribution has been completed. toolbar-> folder->show field-> cost distributed & billable fields to check the status. Note: The non billable expenditure items incur only cost, no revenue or invoice process required for non billable items. In cases where we need the cost calculation at a different rate then the cost rate defined in the rate schedule the cost override functionality can be used. Navigation: PA Responsibility->Setup->Costing->Labor->Labor Costing Overrides. Enter the costing rule, override type, rate & currency. The rates would be applicable for the period as per the start and end date defined for the employee.